As of 2015[update], many interchangeable-lens digital cameras have image sensors that are smaller than the film format of full-frame 35 mm cameras. [a] For the most part, the dimensions of these image sensors are similar to the APS-C image frame size, i.e., approximately 24 mm x 16 mm. Therefore, the angle of view for any given focal-length lens will be narrower than it would be in a full-frame camera because the smaller sensor "sees" less of the image projected by the lens. 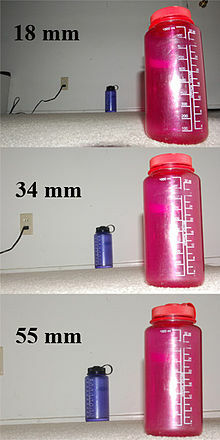 The camera manufacturers provide a crop factor (sometimes called a field-of-view factor or a focal-length multiplier) to show how much smaller the sensor is than a full 35 mm film frame. For example, one common factor is 1.5 (Nikon DX format and some others), although many cameras have crop factors of 1.6 (most Canon DSLRs), 1.7 (the early Sigma DSLRs) and 2 (the Four Thirds and Micro Four Thirds cameras). The 1.5 indicates that the angle of view of a lens on the camera is the same as that of a 1.5 times longer focal length on a 35 mm full-frame camera, which explains why the crop factor is also known as a focal-length multiplier. As example, a 28 mm lens on the DSLR (given a crop factor of 1.5) would produce the angle of view of a 42 mm lens on a full-frame camera. So, to determine the focal length of a lens for a digital camera that will give the equivalent angle of view as one on a full-frame camera, the full-frame lens focal length must be divided by the crop factor. For example, to get the equivalent angle of view of a 30 mm lens on a full-frame 35 mm camera, from a digital camera with a 1.5 crop factor, one would use a 20 mm lens.